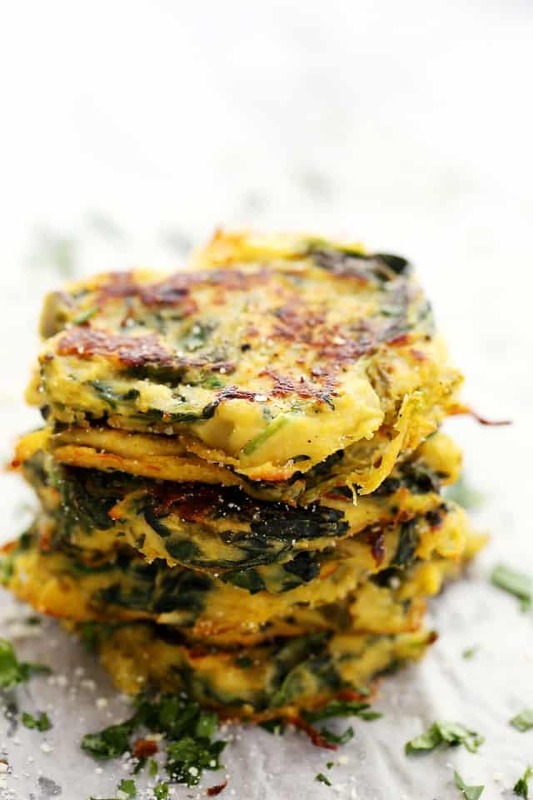 Spinach, Kale and Spaghetti Squash Fritters – Flavorful, healthy, quick and easy baked fritters with spinach, kale, and spaghetti squash. Can I tell you that sharing these fritters was almost a heartbreak? They were SO, SO GOOD that I honestly just wanted them all for myself. Wish I had bought more than one squash. Lesson learned. SO! What’s up? TGIF! No, really. THANK GOD for Fridays! It’s been a rough week, yo. Between dance practices, soccer, and the Pope’s arrival, I’m all kinds of busy. By the way, why can’t I stop stalking every move the Pope makes? I’m worse than CNN. Great man, though. I’m liking him more and more each day. I may not be Catholic, but as an individual and a person of Faith, I can’t help but respect someone as humble and as grateful as Pope Francis. AND he’s not worried about wearing Gucci Loafers… so… the proof is in the puddin’. 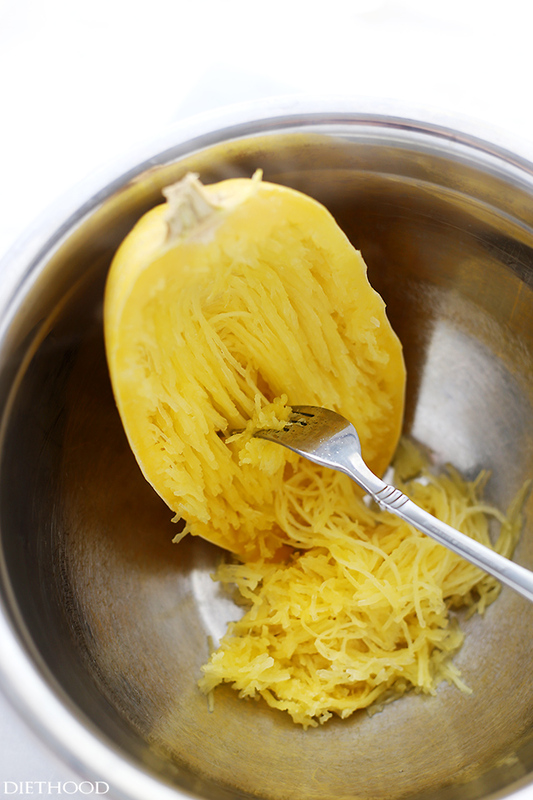 Speaking of pudding, do you like spaghetti squash? I love IT. It’s such a cool veggie, and there are so many ways that you can prepare it. 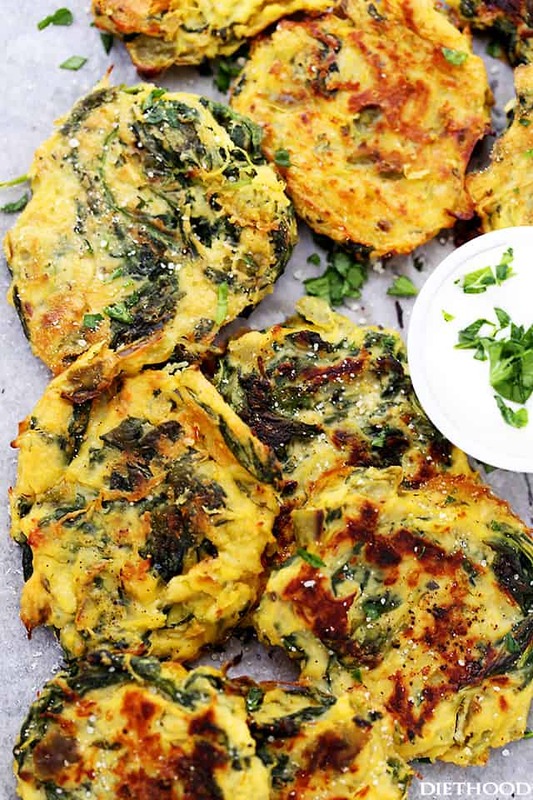 You can use it as a substitute for noodles, you can use it as is, a veg, or you can make these awesomely awesome fritters! Really, though, if I’m being honest, all I wanted to do was just show you an awesome kitchen hack for spaghetti squash; How to Cook Spaghetti Squash in the Microwave in 20 Minutes! Awesome kitchen hack, right?! But then, as I was working on preparing all of that for you, these fritters came to mind because of a bag of kale/spinach mix I had in the fridge. One thing led to another, and once I was done with all the picture takin’ of the microwaved spaghetti squash, I jumped back into the kitchen and the results are now right in your face! And I’m so glad! I didn’t have any expectations for these squash fritters – I was just happy that I didn’t have to think too long about what we were going to have for dinner. All the inspiration was right in front of me. Sidenote: I’m no dummy, but it took me a good 3 years of running this bloggity blog to learn that many of you come here looking for inspiration more than looking for an actual recipe, and that makes me happity happy! I love knowing that even if you didn’t make it exactly as I did, I am very happy to know that I inspired you. Thank YOU! Continuing with my honesty… I thought I could work these fritters into something that could be shaped in between my hands, but no. That did not work. It could have, BUT I didn’t want to because this other method worked just as well. Instead of adding a pound of flour and bread crumbs to the mixture, I kept all that to a minimum and, instead of making thick cakes sort of speak, I spooned a bunch of thin rounds of squash mixture onto the baking sheet and that was it. No messy hands and no time wasted on shaping cakes. WIN WIN! Also? I don’t like to add much more to these, so I just served them with a side of plain yogurt and no one complained. Dare I say, they were just as awesome without it. 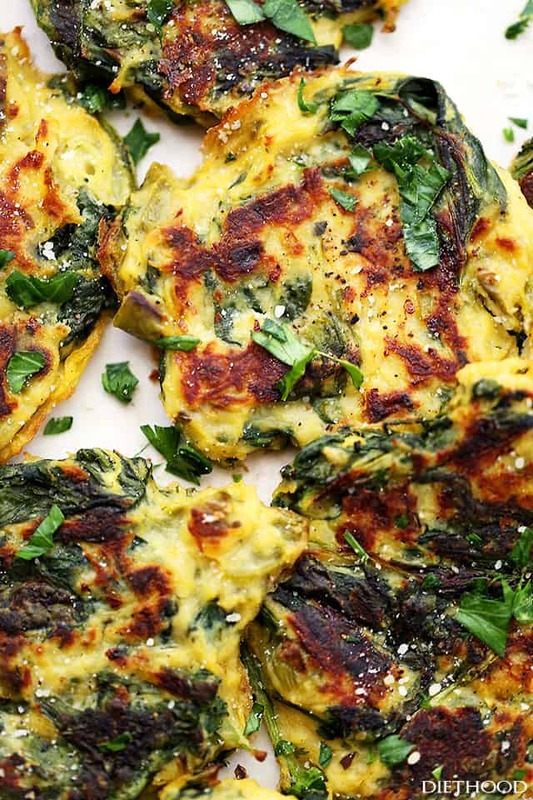 Flavorful, healthy, quick and easy baked fritters with spinach, kale, and spaghetti squash. Prepare spaghetti squash according to this recipe HERE. Line 2 baking sheets with foil and grease with olive oil cooking spray. Set aside. In the meantime, prepare the greens mixture. Heat butter and olive oil in a large nonstick skillet; add diced peppers and salt and continue to cook 3 to 4 minutes, or until peppers begin to soften. Add garlic and cook for 1 minute or until fragrant. Stir in spinach and kale; season with salt and pepper, and cook for 2 to 3 minutes, or until wilted. Remove from heat and transfer to a mixing bowl; let stand a few minutes to cool. 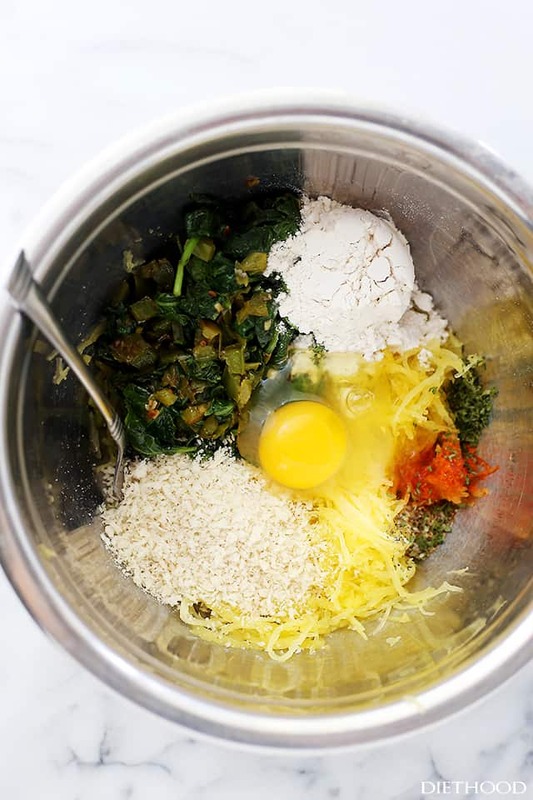 Add spaghetti squash strands to the spinach mixture, as well as the parmesan cheese, flour, panko bread crumbs, egg, seasoned salt, oregano and parsley; mix until thoroughly combined. Place in the fridge for several minutes, or until slightly cooled. Remove from fridge and spoon mixture into 2 to 3-inch rounds on previously prepared baking sheets. Lightly spray tops of rounds with olive oil cooking spray. Bake for 10 minutes; flip the fritters over and continue to cook for 8 to 10 more minutes, or until browned on top. Continue to do the same with the second baking sheet. Remove from oven and transfer fritters to a serving plate. You can serve these as a side dish or as an appetizer. How could I warm these up to serve later in the day? Like to make them an hour ahead of company arriving for dinner. I would place them on a foil-lined baking sheet and pop them in a 325F degree oven for 15 minutes, or until heated through. These fritters are absolutely delish! I added onion powder and garlic powder for a little bit of extra flavor. I can’t wait to make them again! Omg. I love these. So tasty. I’ve made these twice this week. Mmmm Thanks so much . Showing a dipping sauce, what is it? What a great way to use spinach. I like that you paired it with Kale because they make the other taste better. 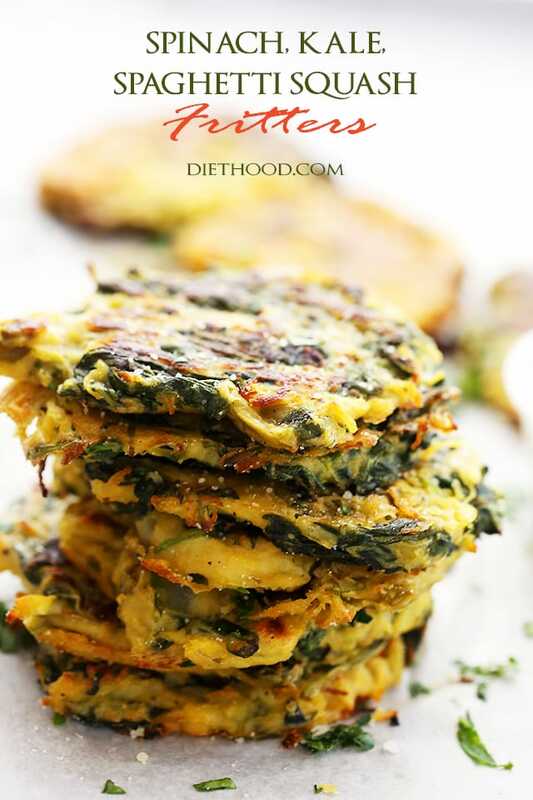 Spaghetti squash fritters!! Ahhhhhhh, you are a GENIUS! I would definitely keep these all to myself. YUM! I’ve been wanting to make something like this, you’ve inspired me! 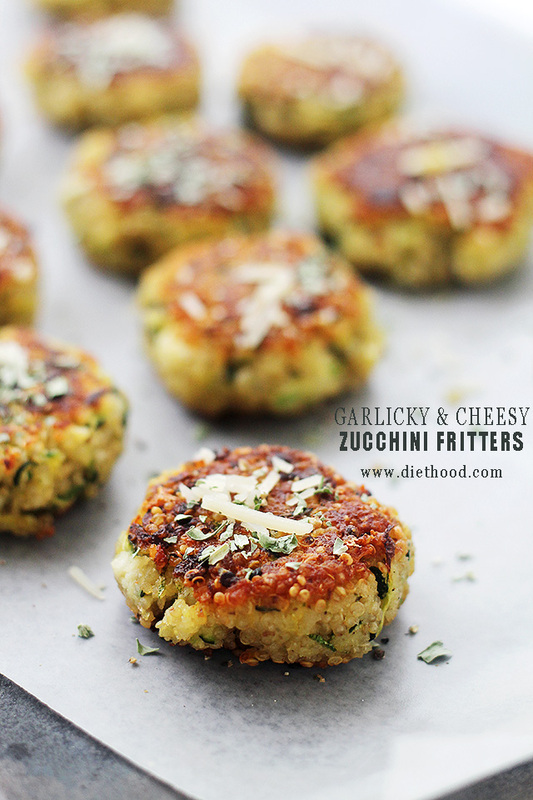 These look perfect, healthy and delish! This just might be my new favorite way to have spaghetti squash! Oh my lordy! I want that whole stack! These look amazing Kate! 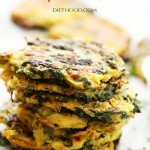 Never thought of using spaghetti squash in a fritter, genius!! Squash is a huge staple in my house this time of year! As someone who hasn’t thought too far outside the box when it comes to spaghetti squash, I gotta say: THIS IS THE BEST IDEA. Love the idea of these little snack cakes, I want to make them right this second! Ok, seriously awesome kitchen hack and LOVE this recipe. I would not be able to stop snacking on these fritters, the crispy outside and soft inside kills me every time! Yes please, these fritters are the best! I could be happy eating these for every meal! I love vegetarian recipes that are this crave-worthy. Pinning and Tweeting and I can’t wait to make these. Thanks!! I adore spaghetti squash. I’m so excited to start cooking with it this fall. I’m pinning this to make soon. Looks delish! 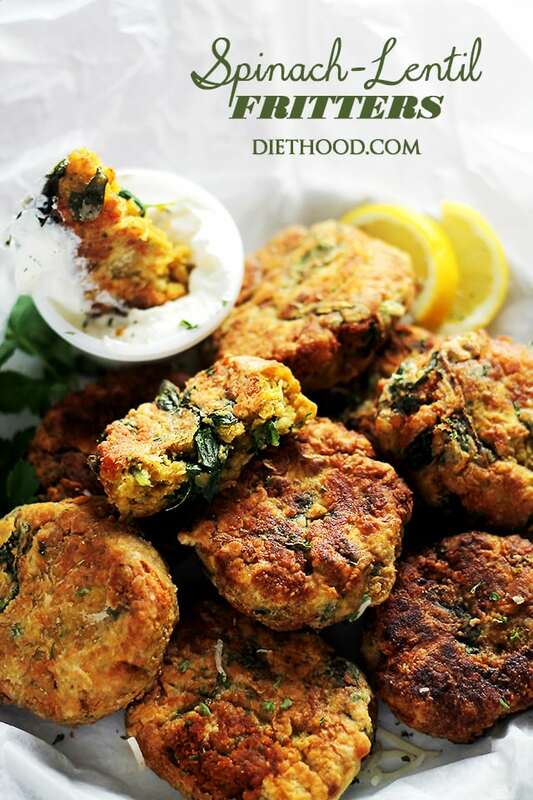 I would be such a happy girl with a big plate of these fritters in front of me for dinner! I love all the veggies in there and the addition of garlic is perfect – YUM!